Alcohol is a very common issue as we know. It affects lots of people, lots of families, and lots of relationships. Today we are going to talk more about this topic and how it affects our lives. Did you know that according to a 2015 National Survey on Drug Use and Health, that around 86% percent of adults 18 and over report drinking alcohol, 70% or so report drinking in the last year, and 56% in the past month. So what this says it that most of us drink at some points. But is drinking in and of itself a bad thing? There is certainly a debate on light alcohol usage being a problem as you may have heard studies that talk about the benefits of consuming small amounts of red wine on occasion. Physically speaking light alcohol consumption can cause some issues but that are more easily reversible. There have been studies that show that in 90% of people that consume more than a half an ounce of alcohol per day that fat increases in the liver. Again though with reduction this will often decrease. Even spiritually speaking, the Bible seems to suggest again that light alcohol consumption is acceptable. For example, in Ecclesiastes 9:7, it says “Go, eat your food with gladness, and drink you wine with a joyful heart, for God has already approved what you do.” However, it does talk about getting drunk on wine as being unacceptable. Relationally speaking you might recall times where you went out with your partner or others, enjoyed an alcoholic drink and have a fond memory. However, alcohol issues are well documented in the issues they cause. Let’s first talk about the different stages of alcohol use. This according to an article called Stages of Alcoholism (link provided in resource section). After going through this do you think alcohol might be an issue for you or your partner. 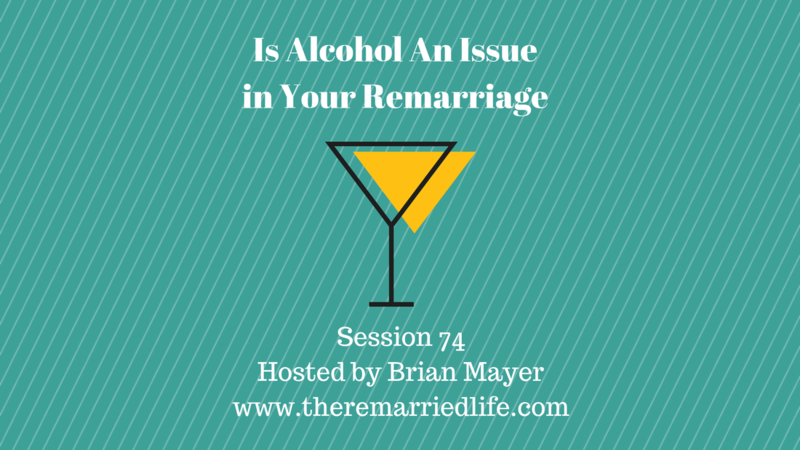 Alcohol use is probably more prevalent in remarriage because of the difficult nature of divorce and all the issues that go on with the complications we endure. Part of the issue with alcohol use is that none of us think we have a problem with but this is certainly far from the truth. Along with that issues of not thinking we have a problem, means that we may think we don’t need to seek help or in fact may completely refuse any kind of help because the issue has so gripped us. Call SAMHSA (Substance Abuse and Mental Health Services Administration) at 1-800-662-HELP (4357). It is free and they will refer you to a state funded treatment program or a program that charges on a sliding scale. Go to their website for more information including lots of free useful pamphlets that you can see immediately. The link for that is also below in the show notes. Alcohol Rehabilitation Centers in your area can be a helpful resource. These facilities generally offer in patient meaning extended stays and outpatient services. Alcoholics Anonymous is a group resource where you can talk to others who also struggle and gain support and encourage and accountability. Al-Anon is for those of you that are worried about a loved one with a drinking problem. You can get support and meet with others who also have loved ones with issues. Please take alcohol consumption seriously and think about the warning signs and issues and get help if you need it. There are lots of caring people out the ready to help and if you don’t find someone who cares, then hang up and try someone else. Disclaimer: The information provided on this site does not constitute legal, accounting, or mental health advice, and there has been no professional-client relationship formed in the use of this website.